Personal Transport Extended Warranty Protection Plan - 3 Months FREE! We did it. Sure it doesn’t look just how we imagined it, but we have solidified our place as the future. Humanity has made hoverboards. And you, being you, have decided to purchase one, because why wouldn’t you? But you’re nervous about what happens if it breaks. Luckily CPS has you covered. We’ve got the perfect hoverboard protection plan for you. 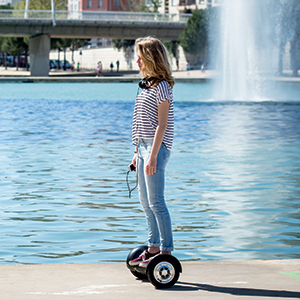 Our hoverboard extended warranty covers your hoverboard for 1 to 2 years. Our coverage includes hardware failure as well as accidental damage. So if you forgot to bring your hoverboard inside on a misty morning, you’re covered. And if you dropped your hoverboard while trying to catch your train, you better believe you’re covered. Our hoverboard contract starts the day you purchase your hoverboard, with coverage starting on day 31 when most store’s return policy ends. In order to qualify for coverage, your contract must be purchased at the same time as the hoverboard. This contract does not cover drops over 6 feet, intentional damage, full water submersion, or lost or stolen boards. When you file a claim, you will need to pay a small deductible for repairs. So, future person, ask your dealer if they offer a CPS hoverboard extended warranty. If they do, go ahead and purchase one, and board confidently into your future, knowing your hoverboard is ready for anything life throws your way. Will my coverage continue after my hover board is repaired? Yes, your coverage will continue until the contract expires, or until the cost of repairs have met the maximum liability of your hover board (the original price you paid for your hover board. Will I have to send in my hover board for repairs? Yes, you will. If your hover board breaks, we will provide you with instructions on shipping it to CPS’s repair facility. Once we receive it, we will complete repairs for your vehicle. What happens if the service center cannot repair my hover board? If we cannot repair your hover board, we will provide you with a check for the current market value of your hover board. What doesn’t this plan cover? This plan does not cover lost or stolen hover boards, intentional damage done to the board, drops over 6 feet, or full water submersion. I have a manufacturer’s warranty on my hover board, when does my coverage start? Your contract starts on the day you purchased your hover board, with your coverage starting on day 31, after most stores return policy ends. I already purchased my hover board, can I purchase an extended warranty now? Unfortunately to qualify for coverage the contract must be purchased at the same time as the personal transport vehicle. How do I file a claim for my hover board?